The value of pipe #569 is n/a points. 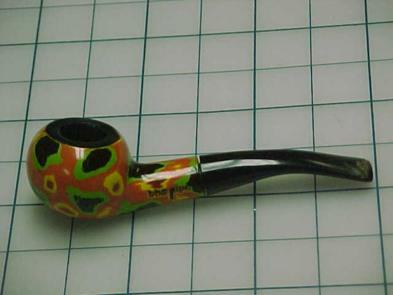 Peter Anthony (hiet) offered a lot with this pipe on eBay. I was amazed to win the bidding, but pleased to have it. It hasn't been smoked much, although the liner does have a couple of small nicks at the top edge. Nothing that would affect smokability. There are some tooth abrasions on the mouthpiece, but no dents or crushing. The paint, as with all the California Styles, is excellent. Sadly, there is no place for it in the collection so it must go the Pipes for Sale page. Sal Vitello grabbed it for his collection.